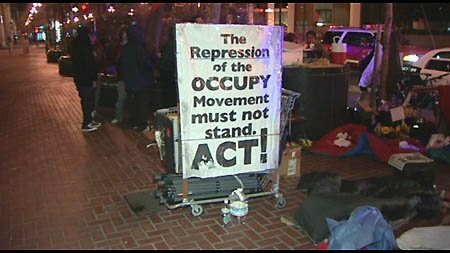 For the second day in a row an #Occupy San Francisco protester was stabbed by another #occupier at the Federal Reserve Bank. A 27-year-old Occupy protester was stabbed Monday night outside the Federal Reserve Bank in San Francisco, one day after another activist was stabbed in the same spot, police and demonstrators said Tuesday. The latest victim was stabbed once in the neck around 11:40 p.m. after a confrontation with a man who was unaffiliated with the Occupy camp, protesters said. The stabber approached campers and began screaming about a conspiracy theory involving the World Trade Center, said Nick Shaw, 32, an Occupy protester. The victim, whom fellow campers knew only as “Jimbo,” chased him down the steps to the Embarcadero BART and Muni Metro station, Shaw said. The man turned and stabbed him. The victim was taken to San Francisco General Hospital and is expected to survive, police said. Activists said the assailant was white and in his 30s, and was about 6 feet tall with brownish-blond hair and a thin build. Sunday night, a man who had been hanging around the Occupy camp for a day or two got into an argument with Brian “Boston” Reid about a missing camera and stabbed him in the chest, police and protesters said. Reid, 28, was hospitalized and is expected to survive. One of the victims, Brian “Boston” Reid, was stabbed on Sunday. He has traveled to several of the #occupy camps and talks about revolution.